1. Sandy McNabb Campground should re-open on June 17. Loops have been extended and there are now shower houses. 2. The Sheep Station information office on Sheep Station Road will be open to the public 9-5 Fri-Tues. Closed Wednesday and Thursday. 3. Re Long Prairie Ridge Loop. Starting soon, a connecting trail will be built from the day-use parking lot north of the highway at the winter gate to Long Prairie Loop trail. I’m told this is mainly for the benefit of equestrians. Hikers tend to start this loop from the Sheep Station parking lot. 4. Some trail names in the Gorge Creek area of the Sheep have been changed to more accurately reflect the country they are travelling through. See the map. 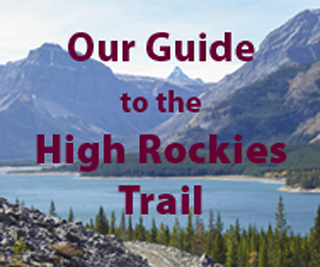 Notice also that some trails have been lengthened, others shortened and some discontinued. Hi Gillean, no that wasn’t me with the spider 🙂 We went again yesterday and found the turn off, unfortunately the weather/universe stopped us this time! we got up an old trail close to the old Volcano ridge staging area, but the wind and rain came in, and we were without our rain jackets! as soon as we got to the bottom the sun was shining, so we headed south and went up the link trail but got turned back again by another storm cell! We will try again this weekend, I will make it!!! Bernbaby: Did we meet you last summer in Gorge Creek at the Indian Oils turnoff? You had this huge spider on your sun hat? If that wasn’t you, then you are not the only ones unable to find the trail to Volcano Ridge. I think where we get lost is at the meadow, just over the bridge, it seems that we should go left, but i think we should be going straight, the trail fades and looks unused past this point, does it pick up?? Help me I am embarassed that I can only put “attempt” in front of my hiking journal entry…. I started from the Gorge Creek parking lot, then NW along the Gorge Link trail, then picked up Volcano Ridge Trail to the junction with the Volcano Creek trail, then back the same route. re: Mosquitoes, yes they were really bad 2 weekends ago, but I hardly saw any last weekend in the Gorge Creek area. Although the bottom trails were wet and muddy, and pretty chewed up by equestrian traffic, the Mt. Ware trail was dry and fabulous. We were on Missinglink Mountain on Friday. Started out on the undesignated Missinglink trail. The parking lot is all chewed up, but the trail itself is OK but very wet in places. The creeks you cross have a lot of water in them. Half way to the pass we took the east ridge route to the summit that we have been up twice before using trails and cutline access roads. This time we varied the return by heading north and east along the edge of the escarpment to a NE-SW cutline that we followed left to Missinglink trail near the pass. The going was good until we hit the pesky little bumps shown on the topo map just before the cutline, which were covered in deadfall. Next time I would cut them out completely and descend via a game trail into the valley to the southwest. Anyway, we returned via Missinglink and again the trail was generally good until we got to the creek crossing above the forks that in the past was of no consequence. This time the culvert had been removed as part of the undesignation and was lying useless on the bank, and the crossing itself had bottomless black mud on both sides from all the extra water. I was in it up to my calf muscles and still sinking before I managed to extricate myself with a great deal of effort. So cross anywhere but at the crossing and that goes for equestrians too. The horses would surely freak out in that stuff. The only other comment I have is that the mosquitoes are really bad this year! Hiked up Allsmoke Mountain today (June 12). The valley portion of the trail is mucky, but the SE ridge route is in great shape. There are snow patches near the top of the peak. I also did some hikes in the Sheep Entrance ridges (K-Country boundary to Death Valley trail). The official trails in the valleys are mud holes, but the new Long Prairie trail is in good condition. There are muddy-soft parts on the new North Pine Ridge trail, but the unofficial trails along Carry and Muley Ridge are in excellent shape for hiking. What route did you take to Volcano Ridge? Did Volcano Ridge last weekend and Mt. Ware this weekend. Still pretty muddy in valley bottoms, but passable. Not a single other person on the Gorge Creek trail today.